With a noticeable difference in the length of daylight there is a sense that a new season is just around the corner. Buds are beginning to swell and early spring-flowering bulbs will be in show towards the end of the month. Plenty of encouragement for us to get outside and start to think about what we need to do in the garden this year. Here is a list of important jobs to do this month. • Make sure birds have food and water. February is the hungriest month for wildlife and it pays to feed your birds and small mammals not only for the joy of seeing them about in the garden but because it will distract them from feasting on any bulbs and buds. • Cut back ivy on walls and overgrown shrubs and hedges before the birds start nesting. • Prune winter-flowering shrubs that have finished flowering, including winter-heathers. • Prune summer-flowering shrubs that flower on new wood. • Prune hardy evergreen trees and shrubs. • Viburnum tinus and V. Bodnantense benefit from a rejuvenating prune after flowering, especially if they are quite mature. The former can be cut right down to the ground if it has been neglected. 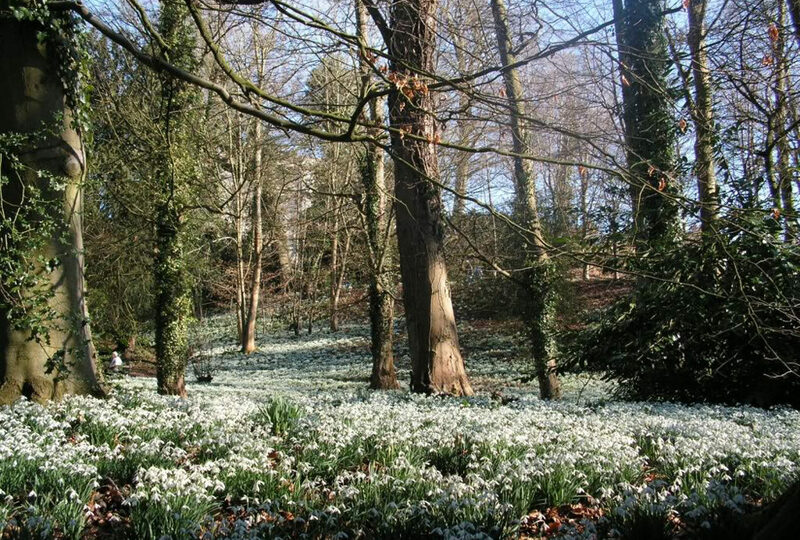 Otherwise for both, removing a third of the older wood will allow new shoots to grow, will de-congest the centre of the plant and will ensure more flowers with that gorgeous winter scent next year. • Older hedges that have overgrown or been neglected can be tackled now. Deciduous hedges and broadleaved evergreens like Laurel can be pruned hard and into shape ready for a growth spurt in spring. Yew can also be pruned back hard, even into old wood, and will recover. • Cut back late flowering clematis and jasmines at the end of the month. The yellow winter jasmine – Jasmine nudiflorum – needs pruning once the flowers are over otherwise it can become lanky and unruly. Cut out any diseased or damaged wood and then spread the main branches over the area that you want covered and tie them in to the wall support to make your basic framework. Then on each main branch, shorten the sideshoots to 5cm from the main stem for a sunburst of flowers next winter. Feed with an organic fertiliser and mulch. If you are short on mulch, a flat stone at the base of the plant will keep the roots cool and the moisture in. • Summer flowering jasmine requires a different tactic; here you have to be ruthless and remove the whole of one of the main stems. Pruning the sideshoots of a main stem will just result in a complete tangle of foliage making it difficult to see the flowers. Remove as many main stems as you feel necessary to keep the jasmine in its allotted space. • Prune off old stems of herbaceous perennials. • Cut back old foliage on deciduous grasses such as Miscanthus. • Cut back Wisteria, to one or two buds from the main stem, removing whippy growth except where you need to train new leaders. • Once the freeze has passed and as long as the ground is not sodden, February’s the best time to plant deciduous hedges and bare rooted trees (including fruit trees), shrubs, roses and soft fruit. bare-rooted trees. As temperatures begin to rise and the soil drains and warms, so plants get off to a flying start. Dig a generously sized hole, add plenty of organic matter, a dollop of Rootgrow, stake on the windward side of trees and tall shrubs to prevent windrock and watch and wait. • If you have not wrapped your tree ferns (Dicksonia) up warm then you really must do so now. February usually has several frosts cold enough to kill unprotected plants. • Divide and plant snowdrops. • Repot or top-dress shrubs in containers. • Protect emerging herbaceous plants from attack by slugs. • Start sowing sweet peas and half-hardy annuals inside. • At the end of the month sow tomatoes, peppers and chillies in a heated propagator or on a sunny windowsill. • Sow onions, early leeks, cabbage, peas and lettuce under cover. • Keep a notebook handy as this is a good time to record details of any planned changes to the garden. If you want a nice looking garden for the summer, now is the time to think about the layout of your garden and maybe call in the services of a garden designer. There are many lovely gardens to visit this month, a few are listed below. 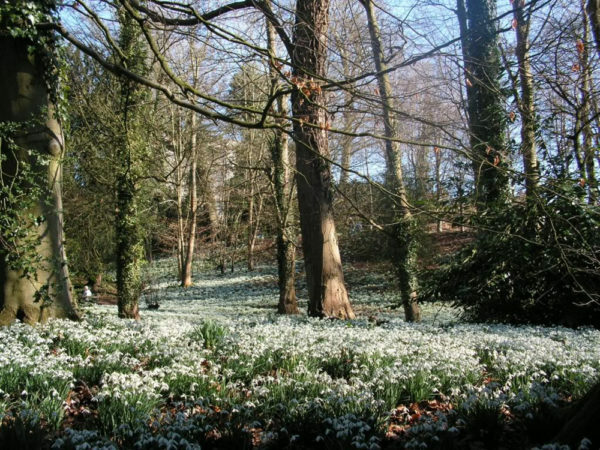 Look out for snowdrops this month!